The term Malakia in Greek 1 means softening. The term indicates softening of larynx. This is a disease of infants and children. This disease is characterised by the presence of stridor (inspiratory) which is caused due to excessive redundancy of supraglottic tissues 2 which gets sucked into the glottis due to the negative pressure caused during inspiration. The term laryngomalacia was first coined by Chevalier Jackson in 1942 3. The stridor in these patients are inspiratory in nature. Laryngomalacia is the leading cause of stridor in infants accounting for approximately 70% 4. This condition gets manifested within first two weeks after birth and usually resolves when the child reaches the age of 2. 1. These patients have stridor which is inspiratory in nature is present immediatly after birth. Is usually made by performing direct examination of larynx under anesthesia 6. It is not possible to perform indirect laryngoscopy using a laryngeal mirror in these infants. Flexible nasopharyngoscope is used to visualize larynx in these infants. This is usually performed under general anesthesia. 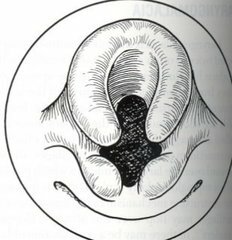 These infants classically show inward collapse of supraglottic structures the moment suction tip is placed at the level of vocal cords. This classic sign is known as “Narcy sign”. This sign is pathognomonic of laryngomalacia. 2. Splinting effect of laryngoscopy blade at the level of vallecula may prevent effectively the collapse of supraglottic structures. Majority of infants with laryngomalacia recover spontaneously as their cartilages and neuromuscular system matures. They recover completely by the time they reach the age of 2. Only supportive measures need to be administered in order to alleviate the agony of the suffering infant. As soon as the acute crises is tided over they undergo spontaneous recovery. 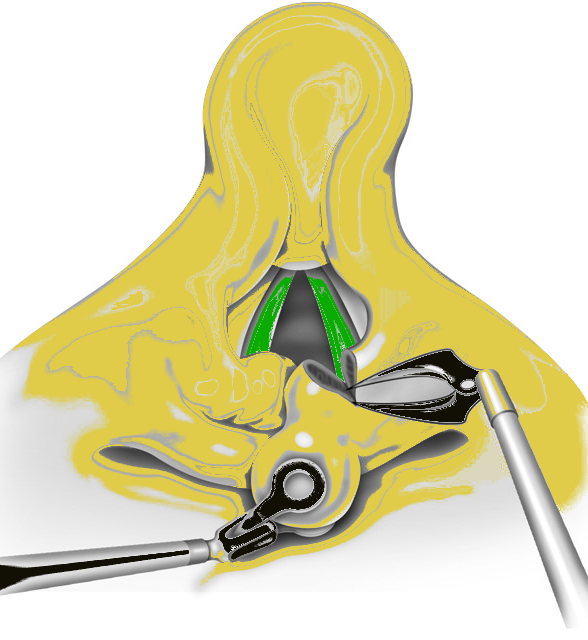 Prior to 1980 tracheostomy was performed in order to alleviate symptoms. Currently supraglottoplasty is the treatment of choice. The major advantage of this procedure is that it addresses the area of obstruction directly. It is advisable to perform unilateral supraglottoplasty initially. In 1922 Iglauer first described endoscopic removal of supraglottic tissue 5 using a nasal snare. In 1984 Dr Lane described removal of corniculate cartilage along with redundant interarytenoid mucosa. In 1985 Dr Seid described the use of carbondioxide laser in the management of laryngomalacia. Topical xylocaine 4% without adrenaline is sprayed over the laryngeal mucosa inorder to anesthetize the area. This procedure reduces adduction reflex of the vocal folds during direct laryngeal examination. Based on the areas of anatomic narrowing a definitive surgical modality is planned. The tip of the suspension laryngoscope used for surgery should be placed in the vallecula or against the laryngeal surface of epiglottis. 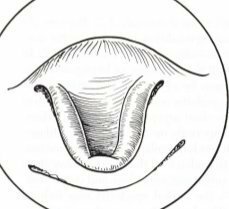 The redundant mucosa over the aryepiglottic folds can be excised by using microlaryngeal instruments. If necessary the whole of aryepiglottic fold on one side can be sectioned. 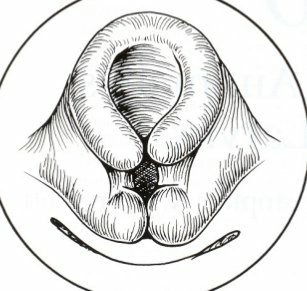 It is better to perform this surgery on one side, and if the effects are not satisfactory the aryepiglottic fold on the opposite side should be attended to at a different sitting. Powered instruments like microdebrider can be used to perform supraglottoplasty. After creating a raw area then a debrider blade is used to excise the redundant mucosa. Laser can also be used to perform supraglottoplasty. This procedure was first reported in1984. This procedure involves resection of lateral portion of epiglottis, corniculate cartilages and the tips of arytenoids. In this procedure aryepiglottic fold is divided 7. This prevents infolding of the aryepiglottic folds during inspiration. This method was popularized by Zalzal 8 in 2005. He used a microdebrider to perform supraglottoplasty. Majority of laryngomalacia patients improve with conservative management and reassurance. Majority of these children outgrow their problem. Rarely surgical intervention were resorted to. In all these patients coexisting lesions like GERD should be ruled out. 7. Werner JA, Lippert BM, Dunne AA, et al. Epiglottopexy for the treatment of severe layngomalacia. Eur Arch Otorhinolaryngol 2002;259(9):459–64. 8. Microdebrider assisted supraglottoplasty for laryngomalacia Groblewski JC, Shah RK, Zalzal GH Ann Otol Rhinol Laryngol. 2009 Aug;118(8):592-7.